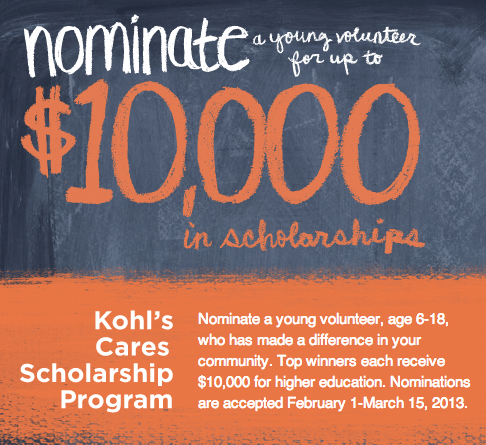 Kohl’s Department Stores will be accepting nominations for outstanding young volunteers beginning next week for the 2013 Kohl’s Cares Scholarship Program. I wanted to write about this because I thought it was a wonderful program and an easy way to show the volunteers in your life that you are noticing the good they are doing for their community. Nominations for kids ages six to 18 will be accepted February 1 – March 15 at kohlskids.com, and nominators must be 21 years or older. Through the program, Kohl’s will award more than 2,300 young volunteers more than $425,000 in scholarships and prizes to reward kids who have made a positive impact on their communities. More than 200 of the store winners will win regional scholarships worth $1,000 toward post-secondary education. Ten national winners will be awarded a total of $10,000 in scholarships for post-secondary education, and Kohl’s will donate $1,000 to a nonprofit organization on each national winner’s behalf. The Kohl’s Cares Scholarship Program is part of Kohl’s Cares, Kohl’s philanthropic program focused on improving the lives of children. Since the program began in 2001, Kohl’s has recognized more than 17,000 kids with more than $3.4 million in scholarships and prizes. To learn more about last year’s winners, visit kohlskids.com. For the best choice in plus size wedding dresses with long sleeves, try online stores like A-Line Sweep, and Where the Heart Is. to consider your wedding theme and the colors for your wedding. An empire waist is a great style, the waistline is right beneath the chest which makes the tummy area less noticeable.